Our bronze beehive door knobs replicate a traditional, Victorian design they are suitable for both mortice and rimlocks. Every detail is reproduced faithfully and the handle has a wonderful patina of use and age. 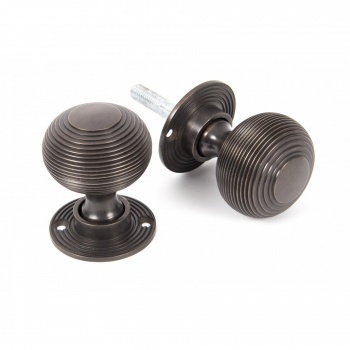 Genuine antique period door furniture is very dificult to come by, our beehive door knobs are as good as the originals. Supplied as a pair with a spindle. Dimensions - Knob 49mm, Rose 50mm, Projection 60mm.